It is that time of year again when a farmer’s thoughts turn to burning. Like most things there is more than one way to skin a cat. However I am going to talk about some of the dos and don’ts for narrow windrow burning. Although at this point you cannot do anything about chaff windrows that have already been produced what you will see is that windrows from a well set up header will have withstood considerable amounts of rain over summer and still be ready to burn. The windrow you can see below has had over 100 mm of rain between harvest and burning. Windrows that aren't over-threshed remain open and aerated like this one. Chaff still on top of windrow despite 100 mm rain.Things to note are that the windrow appears prickly and this shows that during harvest the straw was not over threshed. This has allowed the chaff portion to remain high in the windrow which also aids drying after rain. The crop was harvested at a height of approximately 10 cm. 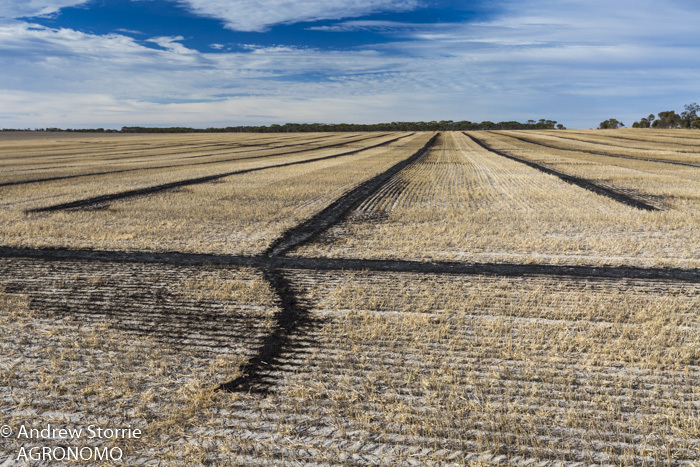 Another critical factor in burning windrows is the meteorological conditions when you start burning. Starting the burn when the FDI is about 7 which in this case was about 18:00.The use of a fire danger index (FDI) has made stubble burning more of a science than a mystical art. The FDI is determined by temperature, humidity, wind speed and dryness of the fuel. These need to be measured and put into the fire index app to calculate FDI. This means that you need a weather meter, either hand-held or cab mounted, and your mobile phone with the app installed. A very useful app for both Android and Apple is Fire Tools by Mountain Pine Studios. Doug Smith measuring wind speed, temperature and humidity to feed into the fire app. Also use the Bureau of Meteorology’s MetEye® site for monitoring local predicted changes to wind speed and direction so you can decide whether to press on or call it a night. 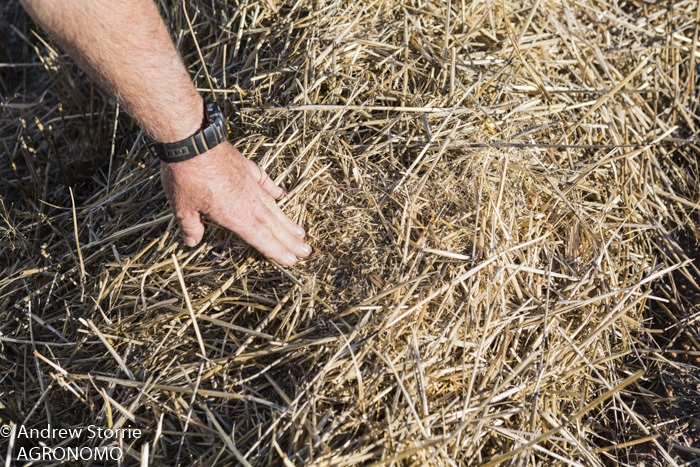 Starting when the fire index is too high means that the file will rarely stay in the windrow and the fire will burn significant portions of the paddock. See image below. Too low and the windrows won’t burn as hot as needed to kill weed seeds in the row. Conditions change by the hour so keep measuring conditions as well as knowing what is coming for the next couple of days before you light up. Check for smouldering rows early the next day so they can be dealt with before the day heats up. There has been a lot of talk and promotion of harvest weed seed management to keep a lid on cropping weed numbers and when done properly it does work. Unfortunately it is human nature to hear the pieces of a message that appeals to us and we don’t give heed to the full story. The burning of narrow windrows appears to fall into this category. Recently there have been some runaway fires which have damaged fences, stubble cover, dry pastures, remnant native bushland amongst other things. Luckily no one was injured or killed and livestock losses were also low. These incidents lead to difficult relations with neighbours and incur added costs and lost opportunities. Stubble burnt from escaped burn. 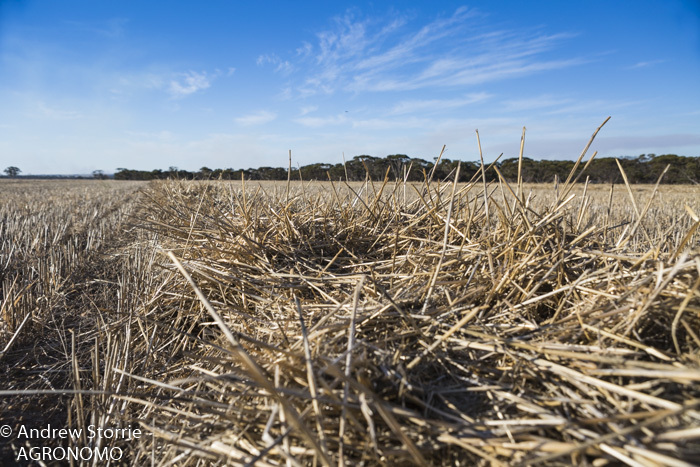 Loss of groundcover will create crop establishment problems with possible loss of crop yield.Sally Peltzer from the Department of Agriculture & Food WA has just put out a timely reminder in the latest edition of e-Weed of the do’s and don’ts of successful windrow burning. Using the McArthur Fire Index, or if you are a hipster with an iPhone, the Pocketfire® app, are good places to start to tell you the conditions are suitable to get a good burn that kills weed seeds but can still be contained. Look at three and 10 day weather forecasts to get an idea of likely wind directions and speeds. Remember basic fire safety. Never light fires alone and without fire fighting gear primed and ready. Light the rows every 50 to 75 m depending on the conditions. Light into the breeze or have a cross breeze. Don’t light the up wind side and hope for the best. Normally there is about a 3 hour optimum time every day to burn narrow windrows and aim to have them out by 10 pm. Check again next morning to put out any smouldering patches. Burnt dry pasture could mean the need to hand feeding in a dry autumn and winter.